I happen to have the good fortune of living within just a few miles of Hershey, Pennsylvania, a small town made famous by that sweet treat that nearly everyone craves and where street lights are shaped like Hershey kisses. During the summer, the town comes alive with families seeking to spend a fun-filled day at Hersheypark. Adult-oriented attractions include the Antique Auto Museum Club of America, which I've written about earlier for this blog, The Hershey Story , which celebrates the history of the town and its founder Milton Hershey, Hershey Gardens, (the subject of a future blog post) and the beautiful Hershey Theatre, to name just a few. Despite attending many performances at the theatre, I'd never seen the place up close and personal absent a crush of people, that is until a few weeks ago when docent Terri Dorwart shined a light on little details and told the story of how the theatre came into existence. During the one-hour tour, I learned quite a bit about the beautiful building that has seen its fair share of stars over the years. It's impossible to talk about the Hershey Theatre, however, without mentioning the man responsible. During the tour, I learned a few facts about the hard-working entrepreneur by the name of Milton Hershey, who conceived of the structure as a community treasure. It's hard to believe that the opulent and elegant building sprung from the mind of a man born into the Mennonite faith. Milton's mother, Veronica Snavely, just happened to be a clergyman's daughter, to boot. Despite this, "Fannie," as she was known, fell in love with Henry Hershey, a man whom many kindly refer to as a "dreamer." Henry never seemed content to stay in one place for very long. One story tells of him hauling the family to Titusville, Pennsylvania in 1860 to take advantage of the short-lived (yet fascinating) oil boom. When this venture failed, he returned to Lancaster County and bought a farm described by some as "rundown." He soon took off on the road and for all intents and purposes, the couple was separated. Throughout his life, Henry seemed to follow this pattern of coming and going as he pleased, often appearing back on the scene here and there to capitalize on Milton's success, and to work for him at times. This didn't seem to bother Milton much and when the old man died, Milton mourned his passing. Milton was permitted to drop out of school at age 13, a surprising fact, given Fannie's penchant for discipline. Young Milton's first foray into the big world was when he took a job as a printer's apprentice. Not surprisingly, he struck out. His mother encouraged him to seek a different path in life, suggesting that he make something tangible and in demand. This inspired Milton to pursue a career in candy making and he began working under the tutelage of master confectioner Joseph Royer. Hershey eventually used his newfound knowledge to set up his own caramel making shop in Philadelphia, working long hours and struggling to make ends meet. 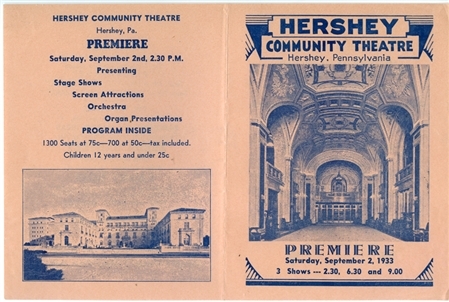 Hershey had what many refer to as "stick-to-it-ive-ness." Each time his future would appear grim, he'd manage to show enough pluck to extricate himself from financial failure. Things finally took a turn for the better after a fortuitous trip to The Great Columbian Exhibition in Chicago. When he laid eyes on a chocolate-making machine from Germany, he saw his future and it included bringing chocolate to the masses. He arranged to have the operation disassembled and brought to Lancaster. "Caramels are a fad, but chocolate is permanent," Hershey was said to have uttered. The Biography Channel uncovers more information on the successful entrepreneur and philanthropist. Milton Hershey's grit and dogged determination played a huge role in his success.When the businessman began making money, he decided to create his own community, offering workers housing and gainful employment. It's been said that residents of Hershey suffered less than most other communities during The Great Depression, thanks to Milton S. Hershey, who was known to most often choose men over machines. The Hotel Hershey, the Hersheypark Arena and the Hersheypark Stadium. The flurry of activity was especially remarkable since it all took place during an otherwise grim time known as The Great Depression. From the minute guests walk through the door of the Grand Lobby, they are enchanted by old world elegance, from the floor, which is laid with polished Italian lava rock, to the walls crafted of four different types of marble, both imported and domestic. Theatregoers will miss much should they fail to "look up" to behold the beautifully crafted ceilings filled with bas-relief images of sheaves of wheat, swans and pastoral scenes. Apollo, the patron god of music, poetry and the arts is shown in his horse-drawn chariot. The inner foyer's "canopy of gold" arched tile ceiling is indeed a stunner and reportedly took two German artisans two years to create. Pictures really don't do it justice. Canopy of gold arched tile ceiling took two German artisans two years to create. A beautiful stained glass window located on the second floor. Zooming in on the Lion on the Main Stage. The sides of the auditorium appear to be modeled to resemble the outer walls of a Byzantine castle, with walls of pink granite and faux balconies on windowed towers. Unfortunately, I didn't have the opportunity to view the theatre's six-ton fire curtain displaying a water color of the city of Venice. 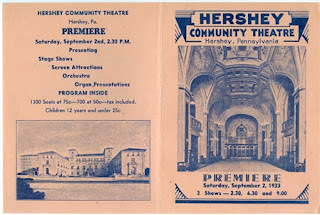 Other features of the theatre include 44 counter-weight lines for sets and lights and a four-manual, 78-rank Aeolian-Skinner concert organ commissioned by Milton Hershey. The organ's 4,715 pipes and 25 bells are concealed behind the French doors of the front balconies. My niece prepares for her future stage career. As we wrapped up the tour, I learned with some excitement, that we would be viewing the dressing rooms, where many luminaries once prepared to take the stage. I'm always a bit surprised at how humble most dressing room accommodations are. I learned this decades earlier on when I visited the "Green Room" of Regis and (at the time) Kathy Lee. The space featured a lone card table, stale donuts and a sagging couch. As the "Fresh Prince of Bel Air's" butler geared up for an interview, he struggled to extricate himself from the well-worn piece of furniture. I recall him being a large man and the not-yet-so-large Will Smith grabbed his hand in an effort to pull the struggling actor to his feet. The dressing rooms in the Hershey Theatre didn't disappoint and I couldn't help but think of all the celebs who spent time in the unassuming areas tucked away in corners beyond the stage. Unassuming spaces where actors prepare to take the stage. Dressing room at the Hershey Theatre. This is just a small taste of what it's like to tour the historic theatre. Tours are held every Friday at 11 a.m. year round, or on Sundays at 1 p.m. starting Memorial Day weekend and continuing through Labor Day. To make arrangements for your own personal tour, call 717-533-6299.